WTF President Chungwon Choue poses with members of 2008/09 Winter Taekwondo Peace Corps in an activation ceremony at GCS International in Seoul, Korea on Jan. 12, 2009. A total of 32 Taekwondo Peace Corps members are to be dispatched to eight countries for one month starting this month. The World Taekwondo Federation held an activation ceremony for the 2008/09 Winter Taekwondo Peace Corps in Seoul, Korea on Jan. 12, 2009. 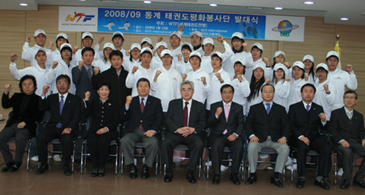 The activation ceremony, held at the headquarters of GCS International in downtown Seoul, drew members of the 2008/09 Winter Taekwondo Peace Corps and dignitaries. The WTF announced a total of 32 successful applicants for the 2008/09 Winter Taekwondo Peace Corps last month. The 32 Taekwondo Peace Corps members are to be sent to eight countries in eight teams for a period of about one month starting this month. The eight countries are Greece, Russia, Morocco, Bolivia, Uzbekistan, Egypt, China and Kirgyzstan. On Jan. 11, 2009 four members of the 2008/09 Winter Taekwondo Peace Corps already left for Egypt, and another four members left for Morocco on Jan. 13. A third four members are scheduled to leave for Greece on Jan. 14. The Taekwondo Peace Corp project is promoted by the WTF and organized by GCS International, a United Nations-recognized non-governmental organization with a special consultative status with the U.N. Economic and Social Council. GCS stands for goodwill, cooperation and service. WTF President Chungwon Choue serves as head of GCS International. "Through the WTF Taekwondo Peace Corps program, I am confident that taekwondo could contribute to the promotion of global peace," said WTF President Choue in a speech during the activation ceremony. WTF President Choue first raised the idea of Taewondo Peace Corps at an international forum in Leuven, Belgium in September 2007. He then proposed an expanded concept of "Sport Peace Corps," involving all summer Olympic sports, at an international forum in Monte Carlo, Monaco in December 2007. The WTF officially launched the Taekwondo Peace Corps in July 2008 and dispatched 28 members to seven regions in five countries, of Paraguay, Pakistan, India, Russia and China, during the summertime of 2008. Reflecting the growing popularity and high interest in the program among the WTF's 188 member countries, the WTF plans to expand the dispatch period of Peace Corps members from the present one month to two months, six months or up to two years.